The Thrill Of The Wild: WoD: WoW Hunter Tools! In the wake of the news that we'll be losing the Female Dwarf hunter spreadsheets, I thought it might be prudent to start getting adjusted to some of the other amazing hunter tools that are out there. So, today we have a special guest here at the Thrill of the Wild. A dedicated raider and hunter maths extraordinaire, Esoth has been playing his hunter since 2006, raiding since BC, and since Cataclysm been part of the highly esteemed guild, Something Wicked, who, despite a limited 3 days a week schedule, continuously manage to stay competitive on the national and international raiding scene. Esoth has been a main stay of the Hunter forums on Elitist Jerks, and has been creating hunter spreadsheets since before I first logged into EJ. For Warlords of Draenor, Esoth decided it was time to switch to a web app, and it has quickly become one of the more popular hunter tools on the web right now, so I asked him if he could give a quick overview of the tool, and how to utilize it. Hello all! Delirium has asked me to give a sort of how-to on using my new hunter web app at http://www.wowhuntertools.com/hunter/ and I’m happy to oblige. First things first, please note that this is intended to match the current state of beta for Warlords of Draenor and will go forward from that. It does not and will not ever work with Mists of Pandaria mechanics. You can check the latest changes on /changelog. As always if something looks incorrect, feel free to tweet at me. The bulk of the actual app part of the site is broken down into a set of tabs, the first of which is for inputting your data. There are two main ways of doing this: either filling out your stats/talents/weapon info, or entering your armory location and hitting the “Shoot” button. This will perform all sorts of calculations that you can now access. But first you should also note that there is a little section under the “Enter Stats” header called “Rotation options”. In this app, you don’t design a priority rotation from scratch. In my experience the priority choices have either been obvious or negligible. Rarely did it matter if you hit Black Arrow and then Dire Beast, or the other way around, in the long run. Instead I have opted to assume a reasonable rotation include a bunch of options to determine behavior. My plan is to add a lot more of these eventually – feedback is welcome here – while filtering out any options that just don’t look to ever be viable. 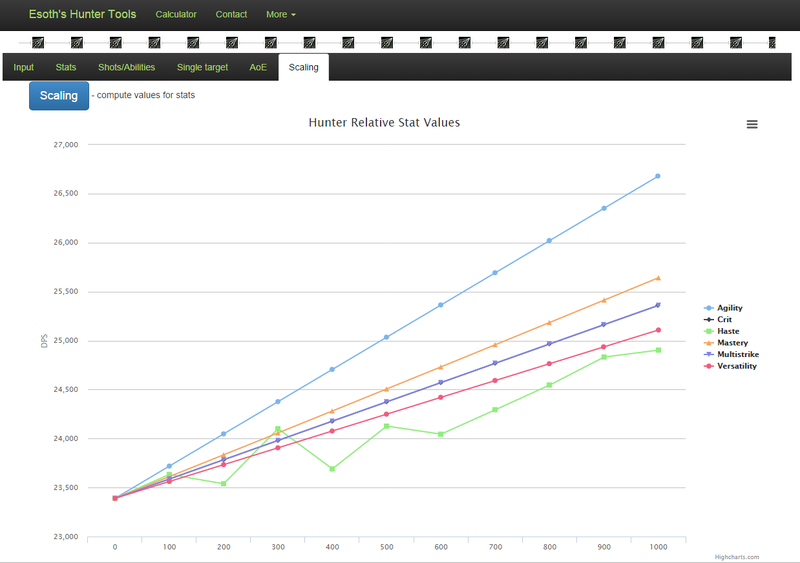 Now that you’ve hit the “Shoot” (my clever, hunter-themed version of “submit”) you can see calculations on other tabs. 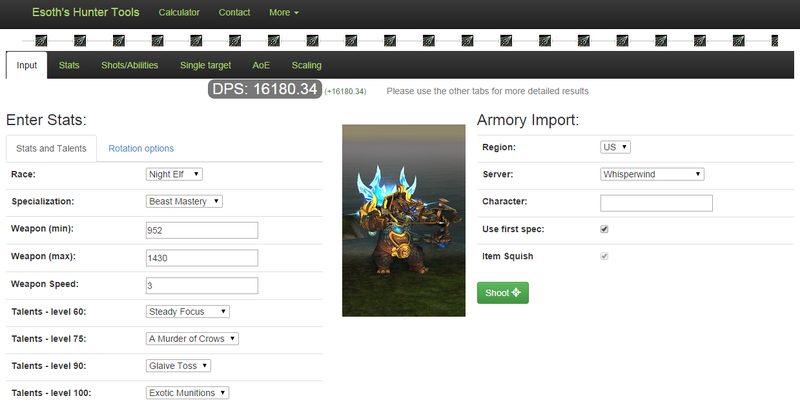 We start from the beginning – calculating your stats from the raw data you input, or we pulled from armory. There are notes about any buffs, food, flask, racials, etc. applied to each stat. “Spells/Abilities” goes a step further and calculates the values for each spell based on your stats and the particular mechanics of that spell. Hopefully this gives some insight into each of these spells about how to make them stronger. The “Single Target” and “AoE” pages are probably most of interest to the average user here – it’s where all of these spells are put together to create that single metric everyone cares about the most: DPS. For each of these it gives a total number as well as a breakdown of each ability’s relative contribution. If you are interested in a more advanced diagnostic, click the View Model button to see how the rotation is actually modeled for your settings. Note that some states (like whether Bestial Wrath is active) will result in a damage change while active. Finally, the scaling tab is available to calculate relative stat weights (i.e. is crit better than haste). I don’t recommend using this too often right now – it’s a very intensive process, because in order to get any meaningful metrics we need to run it with several different stat combinations. It literally takes 60 times as long to compute as your DPS! In the future we will probably have a good idea of how these stat values look for a given tier and be able to recommend stats through a blog post instead. Hunters wanting to look more into their play and how their stats and abilities are working together should make sure you check out his site. Any questions or comments can be sent to Esoth on twitter @Esoth, and you can also check out some great theorycrafting articles at his website/blog, at Esoth.com.